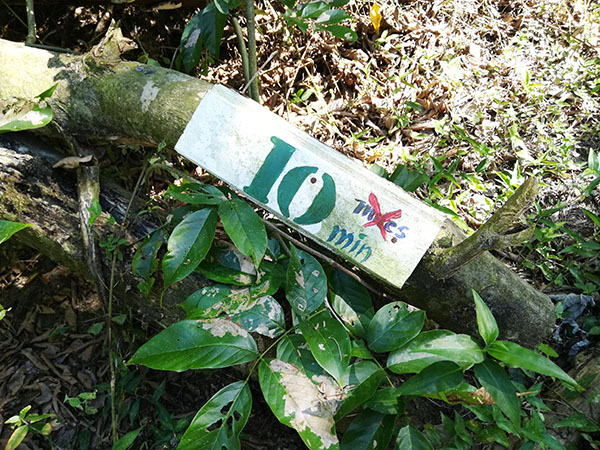 Short of an indiscernible wooden sign with a small hand drawn arrow pointing towards a narrow staircase heading into the jungle, there is no telltale sign of a beautiful oasis hidden on the other side of a dense jungle. In fact, it’s quite likely if you don’t know what you are looking for you could just as easily miss it: A gorgeous, virtually untouched, midnight Black Sand Beach covered in unblemished intact seashells. 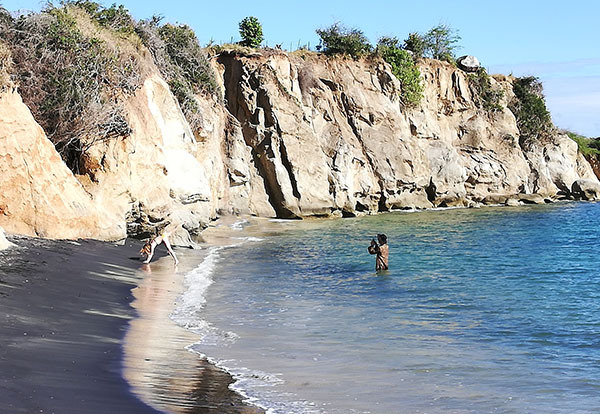 The black sand at Playa Negra is the result of water runoff from Monte Pirata, the tallest mountain on Vieques full of volcanic bedrock, or basalt. Monte Pirata is not an active volcano, however, it is composed of volcanic bedrock due to the magma that originally formed the island. Heavy rains filter through the mountain and carry it eastward towards Playa Negra mixing with the yellow granules and creating a stark contrast at the water’s edge. 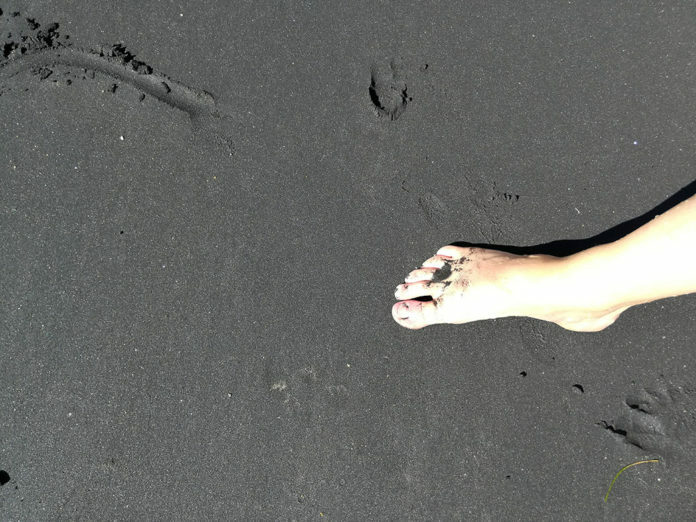 One of the unique features of the black sand at Playa Negra is that it is silky soft and melts underneath your feet. The sand is not only fascinating due to its unusual color but it is also magnetic! The black sand contains high levels of a mineral called magnetite, a type of iron oxide. This mineral not only creates a magnetic field, but it also attracts heat, which makes the sand on Playa Negra much hotter than a white sand beach. It’s also denser, due to a separation process accomplished by gravity called placer deposits which gives the sand its silky texture. 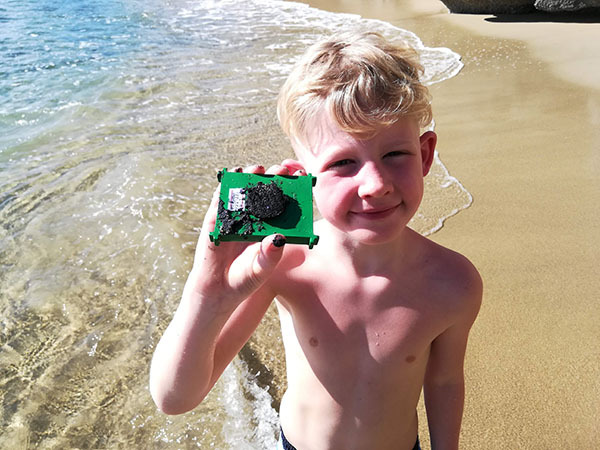 We managed to grab a token magnet at the gift shop before leaving our hotel and heading to the beach, but we’d recommend bringing a handful of hematite magnets with a convenient carrying case so you can investigate fully the scientific properties of Black Sand Beach. Playa Negra can be reached one of two ways, both which require some effort. The first is by walking from Esperanza Beach, located in the shadow of Monte Pirata along the ocean. The second is by hiking through a jungle to reach the beach. 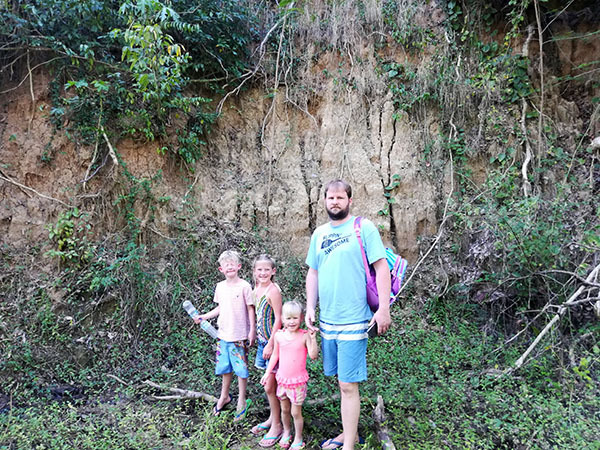 Our family opted to take the hike through the jungle. We simply told our taxi driver we wanted to go to Black Sand Beach and he dropped us off on the side of the road! After ascending a short narrow flight of stairs, the path is well carved out. 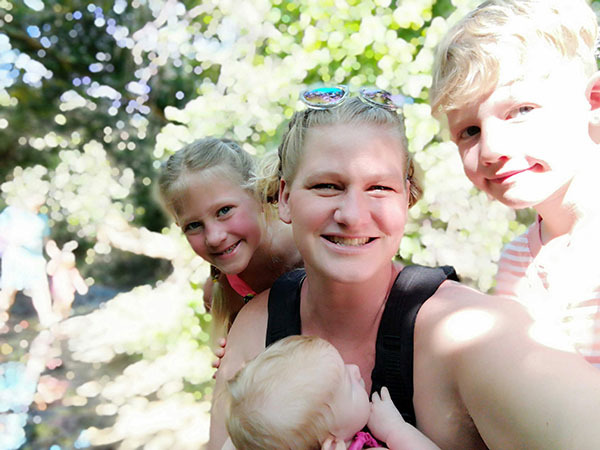 It is a beautiful hike where your family will encounter a variety of plants and growth, streams and tall trees, and even a handful of horses. Vieques is said to have hundreds of wild horses, but the residents we spoke to assured us that none of the horses are wild, they are simply allowed to roam free. 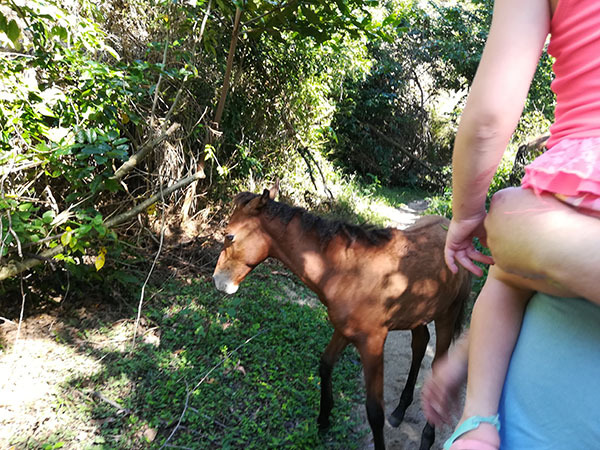 We also encountered a baby horse which we are calling a pony, due to the fact that we do not know the age of the horse thereby unable to determine whether or not she was a foal or a yearling. As you can see, Black Sand Beach offers a plethora of worldschooling opportunities for kids! 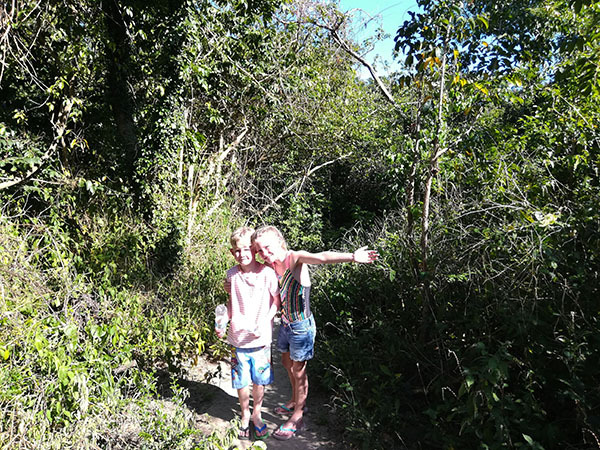 The hike itself is not difficult for families. Our four year old had no troubles navigating the path and exploring along the way. There are some ups and downs, but nothing too strenuous. We had no problem maneuvering the trail in flip flops, but you should expect to get a little dirty from the streambed and mud. In all, the hike took about 10-15 minutes total. Once the jungle gives way, you can immediately see the expansive ocean and the sun as it glints off the surface of the gentle waves. At first, you will not see the black sand, but don’t be disappointed just yet! The black sand is located right at the water’s edge, so you have to cross the length of the beach before you see it and crush your toes into the luxurious black blanket. Due to its secluded location, the beach is nearly deserted. We only saw a handful of people during the few hours we spent tanning in the sun and playing in the waves on the beach. That is, it was nearly secluded except for the scantily clad girl striving for the perfect instagram photo while her boyfriend in a bathrobe stood in the water trying to capture her efforts. I think this one is called the crotch shot? Maybe that’s a hashtag, I’m afraid to search for it. Then there are the seashells! 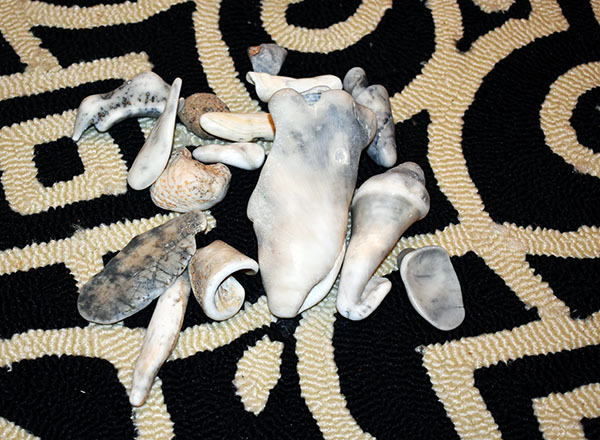 The seashells at Black Sand Beach are phenomenal, intact, whole and smooth with varied colors. 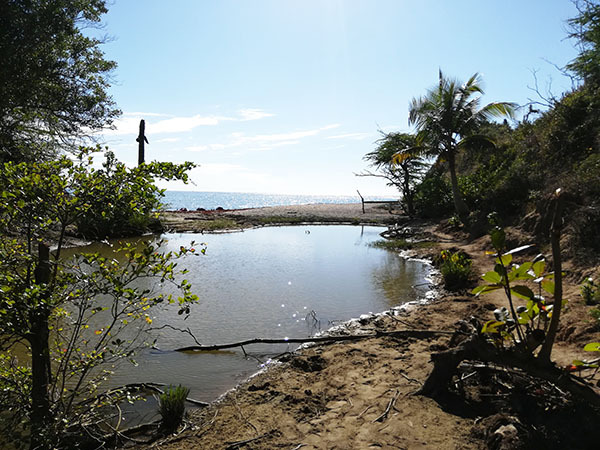 I don’t know if it’s due to the fact that the beach is off the beaten path, or if this location attracts large shells and pieces of coral reef, but we were in heaven exploring and searching for treasures. 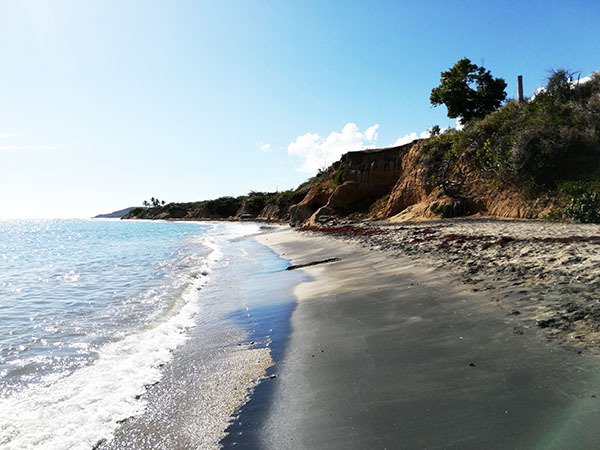 Interestingly enough, Vieques also has a Sea Glass Beach where sea glass can be predominantly found in this specific location. Every second the kids were running back to me with giant mini conches, perfectly spiraled oyster drills, moon snails, horns, whelks, cockle shells, mussels pieces of coral reef and more! We loved collecting them and bringing them home to display. ► For Kids: Playa Negra abounds with awesome worldschooling opportunities. From the flora and fauna and geological changes your family will see on the hike to the beach, including encountering multiple horses along the way, to the magnetic properties of the silky black sand itself. This place is a perfect location where hands on learning meets tons of fun. 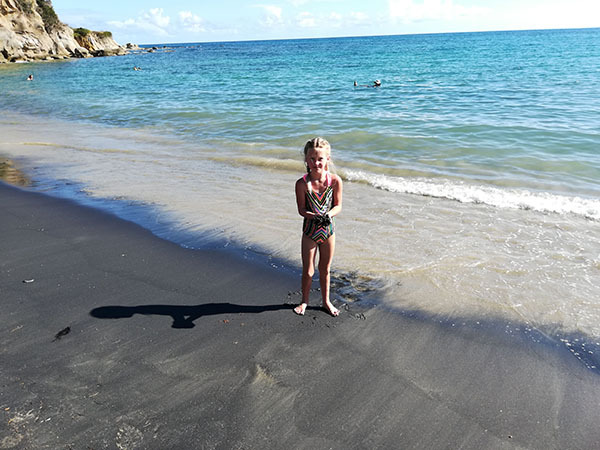 Don’t forget to check out our free Worldschooling Black Sand Beach guide as well! Our other favorite seashell beach is located in Galveston, Texas. Read about our exciting finds at Seawall Beach too! 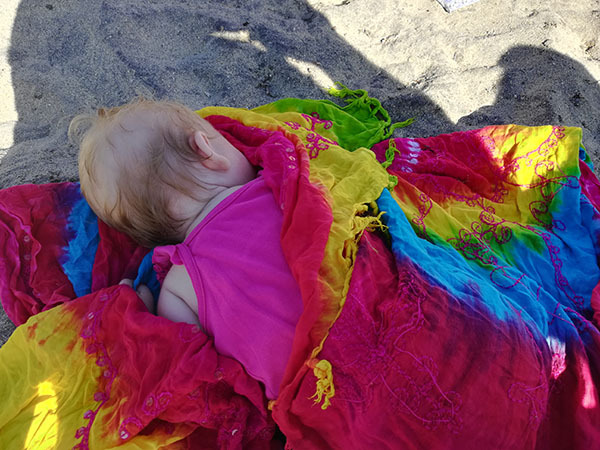 ► Nap-Time Version: All about our family adventure finding the hidden Black Sand Beach on the island of Vieques, Puerto Rico and discovering real magic on its shores! This beach was much easier to access than our failed attempt to reach a Black Sand Beach on Maui, Hawaii (coming soon). Read about all our adventures in Puerto Rico!